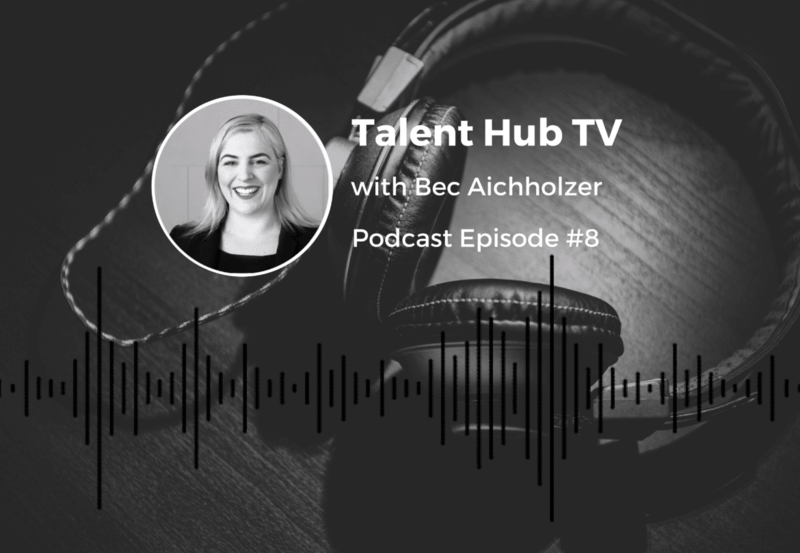 Talent Hub is proud to introduce a Podcast version of the eighth episode of the Talent Hub TV series. Here, Talent Hub Director, Ben Duncombe sits down with Salesforce professionals and thought leaders to learn more about their fascinating stories and market insight. This month’s guest, Bec Aichholzer, joins Ben to give insight into the great work she does within the Salesforce community, co-leading the Women in Tech group and Trailhead Tuesday in Brisbane. As only one of two holders of the honourable Golden Hoodie in Australia, Bec shares with Ben how she originally became involved in the Salesforce space and what the Golden Hoodie means for her. Talent Hub Director, Ben Duncombe talks her views on allies, the importance of equality and diversity within the tech industry, impostor syndrome and of course, Bec’s goals and plans for how she aims to spend her time at the one and only Dreamforce 2018. If you’d prefer to read this inspirational episode, you can find the transcribe below. Ben: Welcome to Episode 8 of Talent Hub TV, we’re here with Bec Aichholzer today, and we’ve got a lot to talk about, so we’ll be discussing the Golden Hoodie, all of the good work that you do in the Salesforce space, across Australia, mainly in Brisbane, and yeah, hear about your plans for Dreamforce. So first off, could you tell us a bit about your background, and I guess, how you are where you are today, in the world of Salesforce? Bec: Sure, so I’ve worked for QIC in Brisbane for about eight and a half years, and four and a half years ago we were looking for a solution that actually helped our sales team be more productive and make more sales, which is always important for the sales team, and so we replaced an old solution that we had, that was a very rudimentary, you know CRM, with Salesforce, went through a whole RFT process and replaced it with Salesforce, had an SI partner that worked with us, and introduced Salesforce, and ever since then, it’s been going gangbusters in our organization. Ben: Okay, and how did your role merge from what you were doing, into then taking control of the Salesforce system, and I guess, growing that career? Bec: Sure, well I didn’t realize at the start, that my job actually would change when I introduced Salesforce, but it was really incremental changes. I introduced this system, you know, this platform that my team could use, and then over time, I realized that I needed to continue working on the system and making sure that it was meeting the requirements of our team. And so my sort of normal role, looking after a lot of the commercial elements of a sales team, ended up being that it morphed into this 50% of that and 50% of looking after Salesforce, and being the Admin, and making sure that it was always working, you know, for the sales team. Ben: Sure, so coming from a completely non I.T technical background, how easy was that for you to do at the time, and how have you continued developing those skills? Bec: It was very difficult at the time because I was trying to juggle, it felt like two jobs, yeah, and so at the time, I didn’t realize that there was a lot of support out there for me. I didn’t realize there was this amazing community Salesforce that has to be able to support me. So for a couple of years, I actually struggled a little bit, until I realized that I could call out for help and that there were people out there. But it really was, you know, over time, I learned that what I was doing inside Salesforce really did complement other parts of what I was doing in my other work as well. And there was a great number of synergies in what I was doing, and now it’s sort of, you know, par for the course that I’m a salesperson with the Salesforce hat. Ben: Sure, and at that point though, no Trailhead right? Ben: So how did you go from zero to 100 and get your hands dirty, but also make sure you were doing things the right way? Bec: Yeah well, I guess because I didn’t realize there was this community that could help me, or that there was Trailhead as well, a lot of what I did was, you know, going into the background and opening up a piece of code and reading it, and thinking ‘do I understand what this is doing? Could I write it? No,’ but could I understand what it was doing, and what parts of the org it was touching, I was working that out, and then I, you know, heard about the, you know, the community in Brisbane, and I started to go along to a couple of the different events that Women in Tech were holding, and the Salesforce User Groups were holding, I even went on to a couple of Dev events, which were a bit over my head, and then I, you know, heard about Trailhead, and I thought, okay, let’s give this a go, and I’m a bit of a competitor, I have a very competitive spirit (talked about that), and so what I did was, I thought okay, I’m just going to challenge myself and do a couple badges, and I think I sat at about six badges for a few months, because work became, you know, all-encompassing again, as it does from time to time during the year. And then before Dreamforce in 2016, I thought, okay I’m going to do 40 badges in 40 days, so I set myself a challenge. So then I ended up, I got up to 46 and I was like, we’re pretty close to 50, let’s just do that, and then after Dreamforce I came back and then by Dreamforce last year, 2017, I thought, I want to be a Ranger before I go to Dreamforce, you know have these goals that I set myself. So then I became in Ranger before Dreamforce, now I’m up to, I think it’s about 100, just under 150 badges, but you know, that’s, badges are a great part of learning, and it’s such a gamified way of learning, and every topic you can possibly think of is tackled. Ben: Ah, everything. Like, when you look on there, you’re amazed at, like how did that end up on Trailhead? But it’s great. Bec: They’ve got ones that talk about sleeping. Ben: So obviously, you found the community and that’s been kind of a key aspect of how your journey’s growing, you’re really a big figure in the community, everyone kind of knows you in the Australian market, so how have you seen the Salesforce Ohana grow, like was that a thing when you first found the community, was the Ohana a thing, and how’s that kind of played a part in your journey? Ben: Yeah, I’ve found the same with Twitter, like I’m not heavily involved in the Twitter scene, but when you go online, you see, it’s as if people have been like lifelong friends. You’ll be communicating with someone in the States or in the UK and it’s like you’ve known each other forever, and I guess you may have met at Dreamforce and things like that, but it really is a global community, right? Ben: So, let’s look more locally and the Brisbane market. So you run the User Group, you run Trailhead Tuesday in Brisbane, can you tell us a little bit about the work you’re doing there, and what the environment in Brisbane’s like? Bec: Sure, so I’m the co-leader of the Brisbane Women in Tech User Group. I work with Emily Hay, she introduced me to, or she invited me to be a co-leader with her, in, I think it was late 2016, after I got back from Dreamforce, she asked me to be her co-leader. So at that time, they were organising Oz Dreamin’, which was the first Dreamin’ event that we had in Australia. So I was kind of on the periphery of the organising committee for that, but then really dove into it during 2017, worked a lot with Emily, doing a lot of the Women in Tech, you know, different functions on mentoring, and the language we use at work, and the importance of inclusiveness and diversity in the workplace, as well, which I’m very passionate about, and so I wanted to make sure that, you know, other women in the Brisbane community felt that they had a voice, because we have such a very strong, you know, a very high amount of women, also in the Salesforce community in Brisbane and in Australia, here, you know, and I don’t feel that our voices are as loud as they could be sometimes, and so it’s about making sure that everyone’s aware of it, and so for me, that’s something I’m passionate about, and I wanted to make sure that other women could feel the same way as well. So that’s our Women in Tech, then also obviously as we’re talking about, on the committee, the organising committee for Down Under Dreaming in its first iteration last year for Brisbane. Now we’re organising one on the 6th of December up in Brisbane, so make sure everyone comes along to it, sign up and register. We are looking for speakers still, *plug*, but yeah no, for us, it’s really important to make sure that the community has, you know, a local event because there’s a lot of events that happen in Sydney and Melbourne, that don’t get to come up to Brisbane, for the Salesforce community, and so we wanted to make sure that everyone there who are Admins, that may not have a travel budget to actually go to Sydney or Melbourne, to see these events, could feel like they’re included in something that might have content from Dreamforce or content that other Dreamin’ events around the world as well. Ben: Well yeah, that leads us in nicely, because you actually went to another Dreamin’ event recently, not locally, how was that, where was it, what was the highlight? Bec: Yeah I was sitting on Twitter funnily enough, in, I think it was March, just probably about two weeks after I got this Golden Hoodie at World Tour – and I got a message from a guy in India who said, ‘we’re having our first Hyderabad Dreamin’ event, would you like to come along and be one of our keynote speakers? I thought, ‘oh my god, this is a bit crazy’ and it was just a direct message as well, it wasn’t it wasn’t anything formal, and I had to question whether it was real and you know, I sort of had a kind of look to myself, as do I think I could do this, because again, you know, and as a woman in tech who feels like an impostor sometimes, because I don’t have the deep technical background that others do, I thought that maybe they’ve got the wrong person, but I thought let’s just do this, so I, my husband wasn’t able to go, so I asked my dad to come along with me, and I flew into Hyderabad but at about midnight on the Thursday night, and spent three days there before I flew back, and it was a crazy three days, I got to meet so many people in the Hyderabad community, and in fact, in the greater, you know, Indian community as well. They’ve got such a thriving, you know, community over there, so many developers and they really wanted me to talk about being a woman in technology, and obviously the gender imbalance in India with females in tech, so it was great to be able to talk to those, students, there was a group of female students in the crowd, who came up, and asked for lots of selfies afterwards. I felt like a bit of a celebrity, but it was really important for me to be able to share my voice of feeling sometimes like I haven’t belonged and making sure that they felt like they did belong, and that was important for me to share that. Ben: Yeah I mean they’re crazy for Salesforce right? Ben: Like when you see the meet-up events there or the Dreamin’ events and they’re just, there’s just so many people, and it’s such a great following. Yeah, for your dad to go and see that, did he have any idea of what, like this Salesforce thing really is? That must have been pretty crazy for him. Bec: It blew his mind yeah, because they don’t spare any expensive either, it was at a very big conference centre and there was about, I think about 600 hundred registered people to go to this Dreamin’ event and this was their first one in Hyderabad, and my dad was one of the VIPs, he got to sit in the front and had a special chair, you know they were so lovely to him, and welcoming as well, and he sat there blown away because he didn’t realize, he thought, okay, Rebecca uses Salesforce, and this is what she does, but he didn’t realize the community that, is so involved and so passionate about this, you know, this platform. Ben: So is he coming to Dreamforce? Bec: No, he’s not, but I’m sure he probably would if I asked him. Ben: So the Golden Hoodie, you mentioned that, so what does that mean to you and what was the, I guess the emotion of being the second person in Australia to be awarded the Golden Hoodie? Bec: Mark was the first, last year or the year before. It was really an experience, so Salesforce asked me previous to World Tour, they said we would like to come and film you in your work environment and you know, a bit of private life stuff, talking about my gym and all of that and they said we just want to come and film you, we’re putting together a video package to show at World Tour, and I thought, this is an honour because Mark was, I knew Mark was going to be the other person in the video with me, and I thought well, you know, it’s nice to be up there next to someone who’s got a shiny jacket, and have myself put forward like that. So I, you know, jumped in with both feet and they came they did about a day and a half of filming, which I thought was crazy, and then at World Tour, they wanted to interview me and show the video package, which was, you know, weird to see and hear me on, you know, a very big screen, and after it they gave me this jacket. Ben: So you had no idea? Bec: No, no idea. I was maybe getting some voices in my ear from a couple of Emily’s telling me that they thought that I was going to get it. No, I was like, don’t jinx it, don’t say anything. Anyway, so I got the jacket and the entire rest of the day for World Tour was a complete blur, it was just people coming up and touching the jacket, and you know, giving me hugs and congratulations and everything, but you know, to your question, what does it mean for me, well a lot of people ask me and especially in India, I got a lot of questions about, well how you get the jacket? Because, I saw so many people who had 10 and 20 times certified, and you know, running, you know, events there and doing all sorts of things that probably in my opinion, might qualify them more for, you know, the jacket than me, but I you know, so I’ve really thought about it, because Salesforce don’t say, well this is the reason we gave you the jacket, they don’t say that to you, they just go, ‘well, you deserve it’. Which is nice to hear that you’ve got recognition, but then you start to question yourself, and it really did spike that sort of impostor feeling. Because I was like, ‘have they just given this jacket to someone not really knowing me’. Bec: Yeah, yeah. But then I, you know, the more I’ve thought about it, especially probably, especially since I got the jacket in March, the number of times that I’ve been able to work with different people in the community probably is the reason why I’ve been given the jacket, and I think it’s because of my community spirit. I think that’s what it is. Because I’ve been to Perth this year, and I’ve talked at the Dev group over in Perth, I’ve just been down to the Sydney User Group a couple of times this year, and I really just think that you know, if anything it’s because of my constant and unwavering support of the community, of the women in technology, and you know, solo Admins, and being the voice for them. That’s been very important to me. Ben: Yeah and you mentioned the impostor word a few times, and obviously that’s something that has to be addressed right, that’s something that a lot of people out there are feeling, so what, and not just women, but let’s target, you know, the women in tech, or people aspiring to work in technology, and make a name for themselves, what’s your advice to those people out there? Bec: Well, that you’re not an impostor. I mean it’s it’s very hard, and even me sitting here with this jacket, sometimes it’s hard to feel like you are, you don’t fit, that you don’t fit the mould, because we so often see, you know, young males, white, wearing hoodies, but, you know, that you are more of a stereotypical tech person than I am. Bec: But just to look at you, people might think that, and so, really, you know, it’s really hard to shake that feeling that you, belong on that panel, that whole male panel that’s sitting in front of you, should have a woman on it, and who’s the voice to say that there should be a woman on it, or there should be more than one women on that panel, and that should be a diverse panel, that should have people from different cultures and backgrounds, and so being an impostor is about addressing it from what people see, it’s about saying, you know, if you have all of these people and are celebrating the fact that, you know, we’ve got all of these great men in the industry, who are, you know obviously very skilled, very knowledgeable, but there are others as well. Sure. We need to bring them along, we need to be good allies, and we need to make sure that we bring those people with us because otherwise, we will, I will, she will, they will, feel like they’re still impostors because they don’t belong. Ben: Absolutely, yeah it makes sense. And have you had a mentor throughout your career? Bec: I would like to say I did. I’ve had lots of different people who I’ve, you know, spent time with, and I think I’m probably pretty good at cutting through the bulls**t if I can swear on this? Bec: And realizing who I want to be like, and who I want to model my behaviours on, and the characteristics that I think are important to share with other people. And so for me, I’ve picked up that, I’ve spoken about Emily Hay a couple of times, she’s been a really great rock for me, introducing me into the Women in Tech community, and embracing me, and giving me great advice, and even last night I was you know messaging her, asking her about a particular issue, and she’s just a, for me she creates a really calming experience when I’m talking to her, but I’ve had, you know, a lot of different people across my work life, and definitely in the last couple of years, that have helped to steer me in the right direction, challenging me, but there’s no one specific person. Ben: Okay, and for anyone watching this outside of the Salesforce ecosystem, with the, you know, that potentially would be interested in a career in this space, why should they get involved? Bec: Oh my goodness, because there are so many things that you can do, you know, there’s, I just think about any career can be applied inside Salesforce. There are so many different elements of every, you know, so many different skills that you can learn in here, that you can apply to every different job, to be honest, and you know, the tech industry itself is only getting bigger. It’s only getting bigger, and you talk about the Salesforce growth by 2020 being so many millions of jobs in this industry, I think that it’s really important to make sure that everyone’s learning skills, everyone’s using things like Trailhead, everyone’s coming along, and learning about, you know, the Salesforce community, because these are skills that are going to set people up for life. Ben: Absolutely. Yeah, I think it’s scary the number of opportunities that are out there in comparison to the skills that are available so, I mean, we’re just finding that we’re just not keeping up with the demand in terms of the growth in this, especially in Australia, but I think globally, and so it really is the market to be in. Ben: Dreamforce. So your third Dreamforce this year, what are the plans, and what are you most excited about? Bec: I’m very excited to finally sit a Cert, so that’s one of the things that everyone asks me with the gold jacket, they ask me, well, how many Certs do you have? And I don’t have any, so, and that’s again, probably part of that impostor syndrome to try to legitimise myself by having a Cert. I don’t really need to do it because it’s not, that’s not what I do at work every day, but for me, it’s that I set a goal for myself at the start of the year to have a Cert by the end of the year, so I’ll be sitting down on the first day of Dreamforce, well, the day before Dreamforce. Bec: Ah, considering I only signed up last weekend, we’ll last see how we go. Ben: It’s on TV now. Ben: There’s no hiding from that. Bec: I’ve sat a few exams and, like a few of the practice exams, and things like that, and keep scoring pretty well, and highlighting areas that I don’t know so well, so that’s real good, but the rest of the week I’ve set myself a goal to meet a few people. Last year I got a selfie with Marc Benioff so that was pretty cool. Ben: You were able to fight through the security? Bec: Yeah, I got through security it was an elevator photo, sorry an escalator photo with Marc Benioff and Lars from Metallica. So I feel like it’s the most epic selfie that there ever was. But this year there’s a couple of other you know, key Salesforce people that I really want to be meet and spend some time with, because I haven’t met Tony Prophet, yes, very much want to meet him, Leyla Seka aswell, I want to meet her, so, just try to, you know, angle myself to get into the right place to meet them would be great. Ben: I think you have a lot of people wanting to meet you aswell, and just if you were, if you’re wearing that jacket, yeah, I think they’ll be asking for selfies with yourself. So, well it’s been great to have you on the show, we’ve really enjoyed it, and yeah, we’ll be excited to catch up with you at Dreamforce, good luck for that Certification. Ben: And we’ll also put some information around the events that you run in Brisbane and so people can join and get onto those. Thank you for listening, and stay tuned for Episode 9, coming soon. You can catch Episode 1 of Talent Hub TV, featuring the only other Golden Hoodie holder in Australia, Mark Tossell, here. You can find more details about being an Awesome Admin and the Brisbane User Group and Trailhead Tuesdays here, and the Women in Tech group here. Talent Hub is a hub of activity at the moment and so make sure you visit our Salesforce jobs page for up to date opportunities, and the chance to win a trip to Dreamforce in San Francisco. If you’d like to become involved in Talent Hub TV as a guest, we’d love to hear from you.